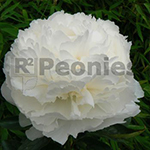 With large bowl shaped flowers is Bowl of Cream one of the most beautiful cut flower Peonies. The strong, upright stems stand firm and hold the huge pure white flowers easily. This slow starter has healthy dark green foliage. Very strong grower and blooms easily. This Peony was an APS Gold Medal Award winnar in 1981. Bowl of Cream is my personal favorite white Peony.